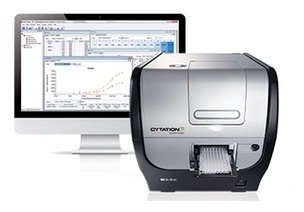 The Cytation family of multi-mode readers offer modularity to meet every laboratory's present workflow needs, and are upgradable for future requirements. Cytation readers feature the patented Hybrid Technology™ which incorporates variable bandwidth monochromator optics and high-sensitivity filter-based detection optics for unmatched versatility and performance. Variable bandwidth monochromators allow selection of excitation and emission wavelengths in 1 nm increments for top and bottom fluorescence measurements, UV-Vis absorbance and luminescence. The filter module is independent, with its own light source and high performance dichroic-based wavelength selection for advanced detection modes like fluorescence polarization, time-resolved fluorescence and filtered luminescence (e.g. BRET), along with available laser-based excitation for Alpha detection. Cell-based assays are optimized with Cytation's incubation up to 65 °C, orbital and linear shaking, plus available CO2/O2 control and dual reagent injectors. Data collection and analysis are managed with Gen5™ software, specifically designed for uncomplicated processing of even the most complex assays.